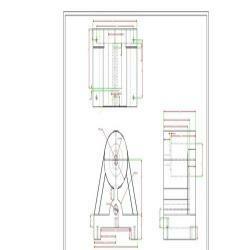 Our services include highly precise solutions to offer system Mechanical CAD Drawing Conversion. Our engineers and developers use advanced software and applications to convert mechanical, building plans, construction documents, as-built drawings, electrical and plumbing drawings into a format suitable for CAD. Further, we can also convert the handmade sketches sent by the clients or other computer formats like IFF and PDF. The final output is presented in fully editable multilayer CAD format. Our organization, Cad Career was established in the year 2006, as a service provider firm. Working as a sole proprietorship firm, we have garnered huge success and consistent growth in all these years. Our highly reliable and flexible services for Tooling Design Services, CAD Drafting Service, Modeling Services, Jigs and Fixture Design Services, CAD and CAM Training Services, CAD Design Engineering services, Welding Fixture Services, Rapid Prototyping Services, 3D Printing Services, Detail Drawings Services, Sheet Metal Component Modeling Services, Fabrication Drawing Services, Reverse Engineering Services, Drawing Conversion Services, Material Handling Equipment Design services, Isometric Drawings Services and Automation Drawings Services. Our high quality CAD designing and engineering services are available at most competitive prices. Our main office is in Indore, while we also have a branch office at Pithampur. With the help of our Structural Designers, Engineers, Visualizers, Surveyors and other staff, we offer most valuable solutions to our clients. We have installed the latest AutoCAD, Pro-Engineer, Catia, UG (NX) and various other software and applications in our unit. Our quality solutions with time bound completion of the projects help clients in achieving maximum profits from the deal. Our mentor, Mr. Rajesh Choube has always supported us and motivated us to perform up to our true caliber. He has helped us in achieving the success with our hard work and true dedication.